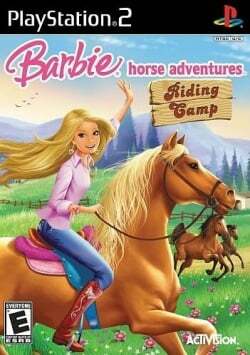 Game description: Barbie Horse Adventures: Riding Camp puts you in the role of Barbie as you explore the wilderness with your horse. It is the ultimate in horse racing as you and Barbie compete for victory. This role-playing game takes you to riding camp, where you develop riding skills, perform a variety of horse care tasks, explore and go on adventures. It's a quest-based gameplay in an open world where you have the freedom to explore the entire island, compete in time-trials and challenges, and earn trophies, medals and ribbons for outstanding performances. Added with customization features, clothes and accessories are Unlocked as you complete your quests. 15 different horses are also available for riding, each with their very own personalities, unique qualities and individual skill sets. There are also 8 unique locations to explore, in a race to reach the finish line. This page was last edited on 5 January 2017, at 17:56.